Rankchaser is a free Amazon keyword rank tracker tool that automates and tracks your Amazon keyword rankings. Visualize and monitor your keyword history with ease! Why track your Amazon keyword rank? Keeping track of your product’s Amazon keyword rankings is vital to the success of your Amazon business. Knowing when your product slips in the search results lets you be proactive and react accordingly. Your rankings slip when your sales volume goes down. Knowing when to increase your advertising budget will help you keep your product ranking high for its keywords. Having descriptive and detailed product copy helps Amazon find the best keywords for your product. Drops in ranking means it may be time to better optimize your copy to suit your keywords. Lower your pricing to better compete and boost sales volume. This, along with increasing advertising budget, is a sure fire way to get your product to the first page. We track your rankings multiple times a day, everday. Want to know when your keyword ranks above or below a certain threshold? Set up an alert and we’ll email you. Your product’s BSR is important so we track that for you too. Convenient charts and historical data gives you insight into your product. Export all of it anytime. Search for your product’s ASIN and add it to your dashboard. Add some keywords that you want to start tracking. Wait a minute or two while Rankchaser gets their rankings. Keep track of your keyword rankings everyday to see if your product strategy is working. You can also set up alerts for your most important ones. Interested in bigger plans? Contact us and we’ll sort you out. Rankchaser is currently available for Amazon US, UK, and CA marketplaces. Subscribe to be notified when other marketplaces are added! Sales from one of my Amazon products started declining and I didn’t know why. I started using Rankchaser to track my keywords and found out I was being priced out of the first page search results. I’m now using Rankchaser to track all my keywords to make sure that never happens again. Kerry A. As a new Amazon seller, I kept reading that keyword rankings were important. I’d been manually tracking my keywords with Excel which was a very tedious process until I found Rankchaser. Well worth the monthly subscription to automate some of my daily tasks. Chris M.
Rankchaser is a service that helps you keep track of your Amazon keyword rankings. When selling a product on Amazon, organic search result rankings for your product’s keywords directly affects your sales. Keeping track of your rankings everyday is time consuming and tedious. Rankchaser solves that by automating the process and tracks your rankings daily for you. How many keywords can I track? The number of keywords you can track depends on your subscription plan. 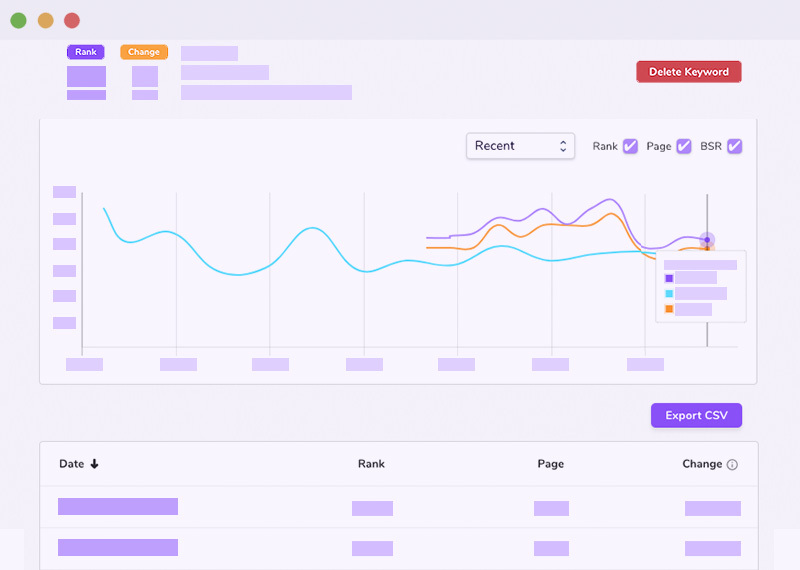 We give you control in how many keywords you can track by allowing you to add additional subscriptions (increasing the number of keywords you’re allowed) anytime or by canceling your subscriptions anytime if you decide you don’t need as many keywords anymore. How many products can I track? 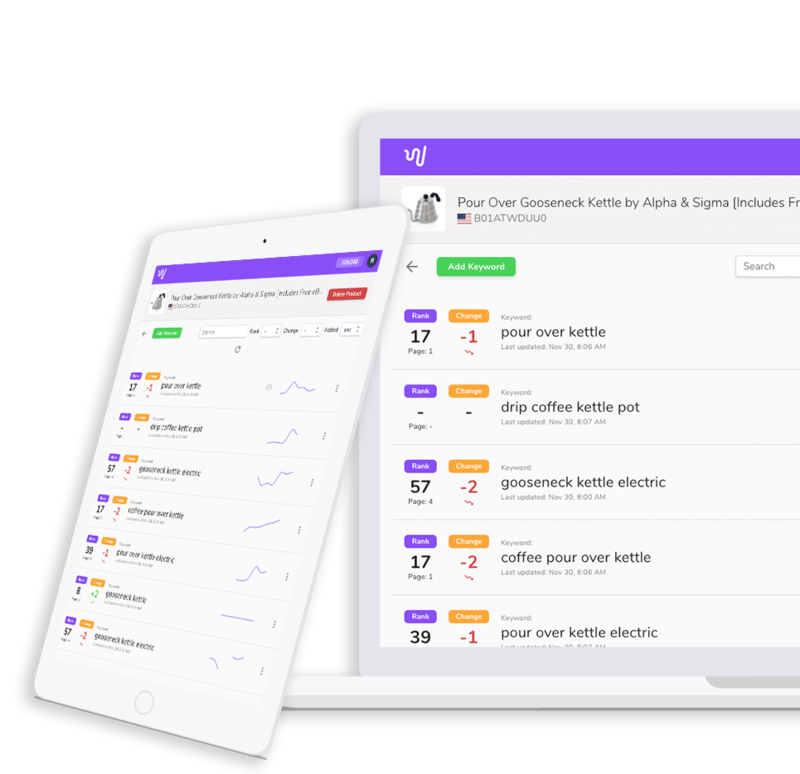 Paid subscriptions come with unlimited product tracking. This means you can add as many products as you want, whether they’re yours or if you’re keeping track of a competitor’s product. Can I try Rankchaser for free? Absolutely! If you’d like to test drive our service, we provide a free plan allowing you to track 1 product and 2 keywords. Additionally, paid subscriptions come with a 7 day free trial meaning you can cancel at anytime before the free trial ends and you won’t be charged. At the moment, Rankchaser supports the US, UK, and CA marketplaces. Support for other marketplaces will be added shortly. If you’d like to be notified when this happens, please subscribe to our mailing list. Keyword rankings are updated twice a day. Product BSR is updated twice a day. Keyword alerts are sent out once a day. Subscribe to be notified of special promotions, new features, blog posts, and more!